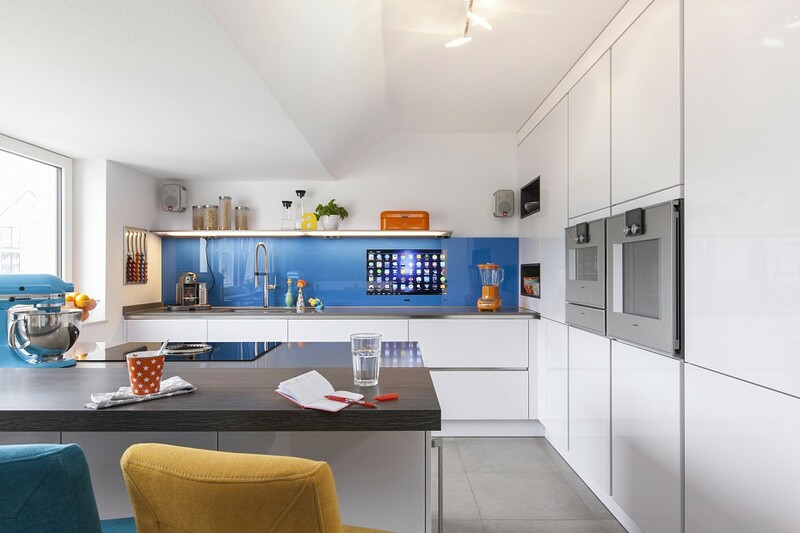 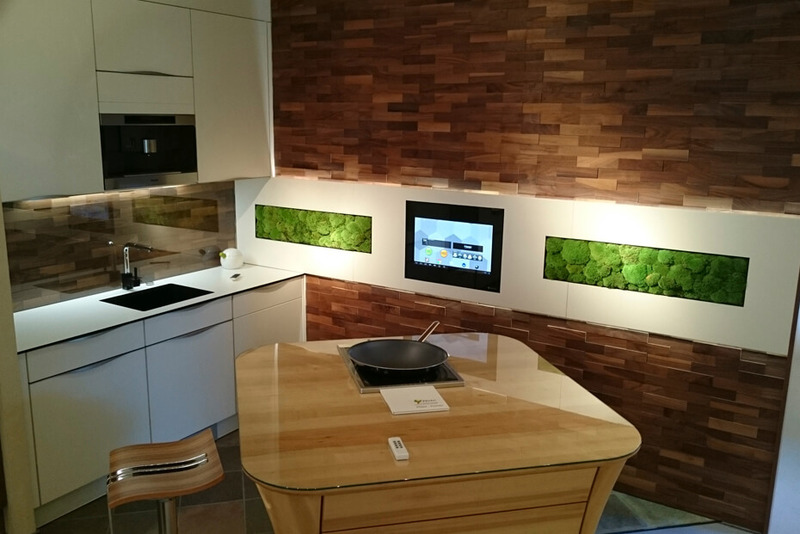 The popular Kitchen award „Das Goldene Dreieck“ was awarded by the musterhaus küchen Fachgeschäften and the magazine „Zuhause wohnen“ to a kitchen with a SMART VISION LCD integration and awarded with the fourth place. 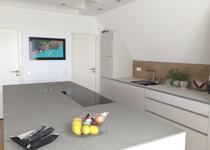 The kitchen was planned and designed by the kitchen studio Jansen from Salzkotten. 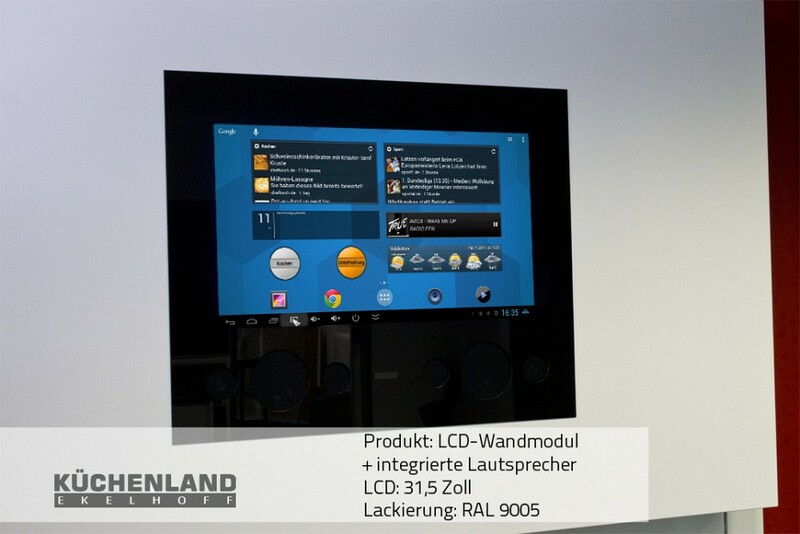 The integrated Android operating system can be operated as simply as a smartphone or tablet thanks to the touch interface. 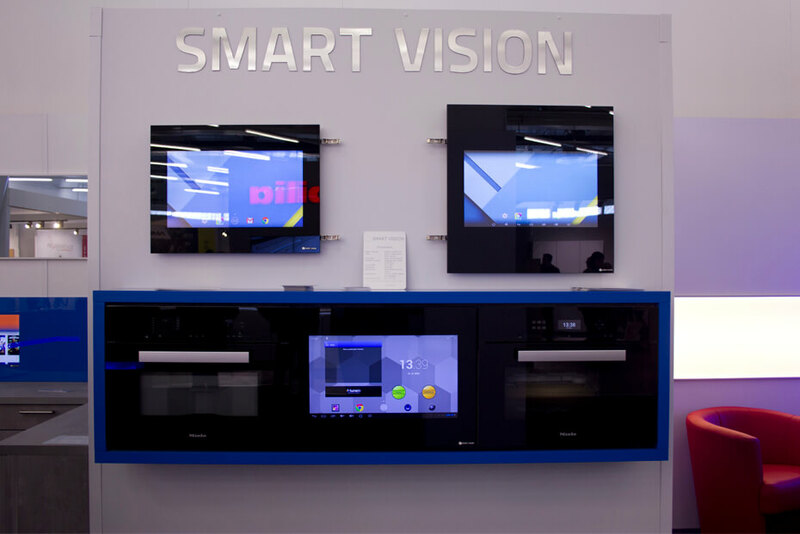 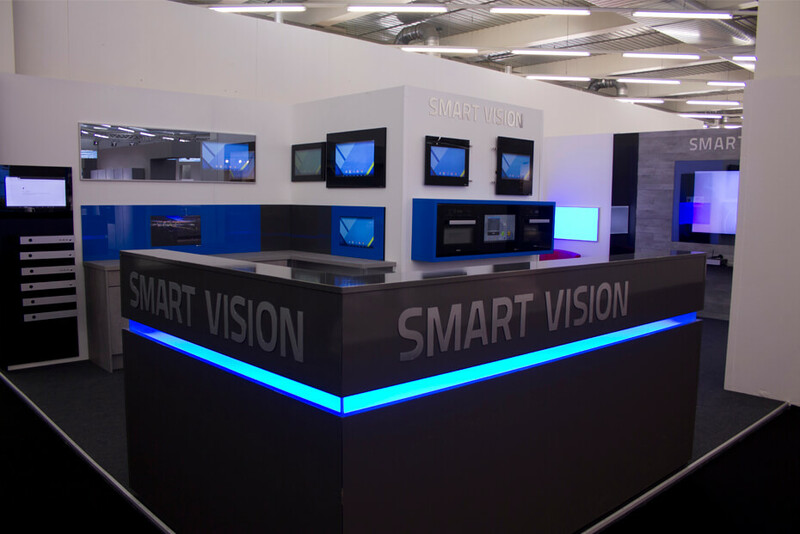 Are you interested in a SMART VISION Mediapanel? 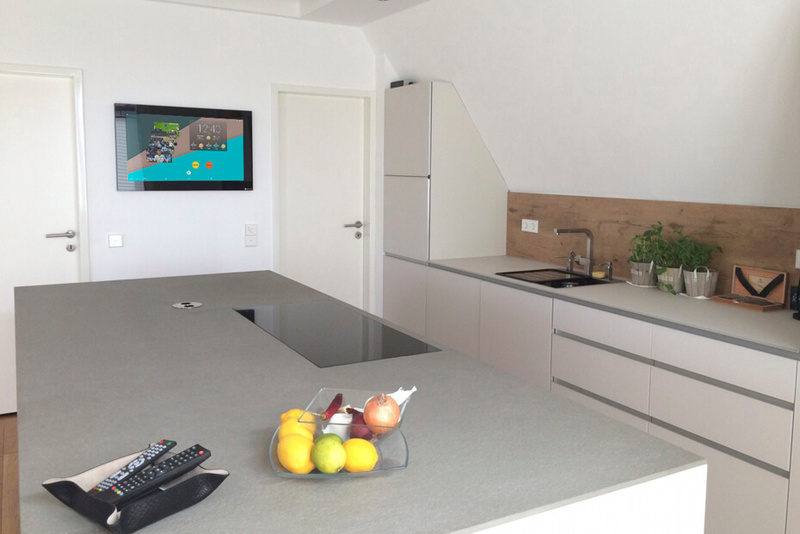 Don´t hesitate to contact us. 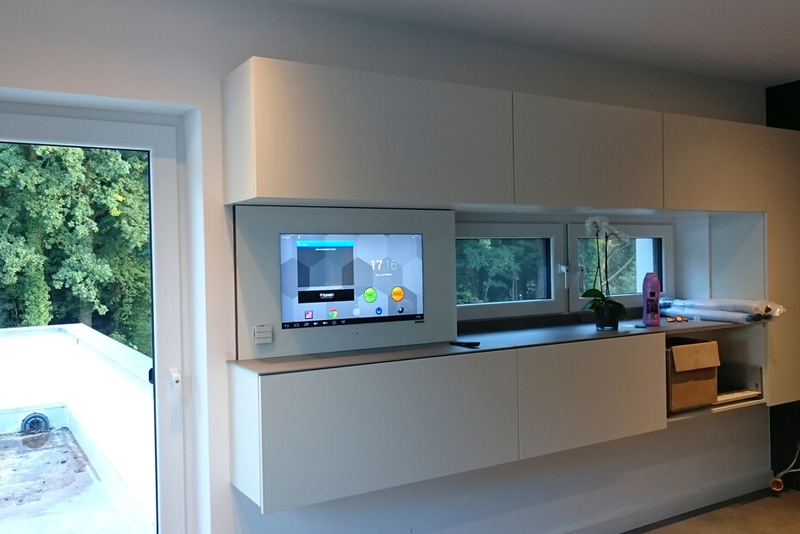 Further configuration options and prices can be found in our prices. 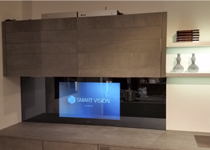 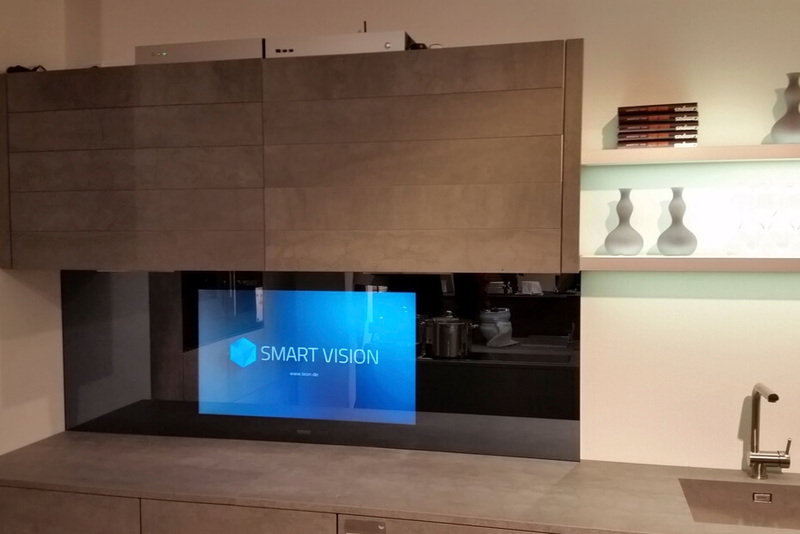 The SMART VISION home entertainment was also exhibited at the international furnishing fair, the IMM in Cologne. 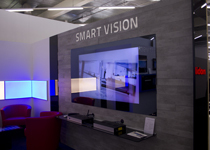 The fair began on 19 January 2015 and ended on 25.01.2015. 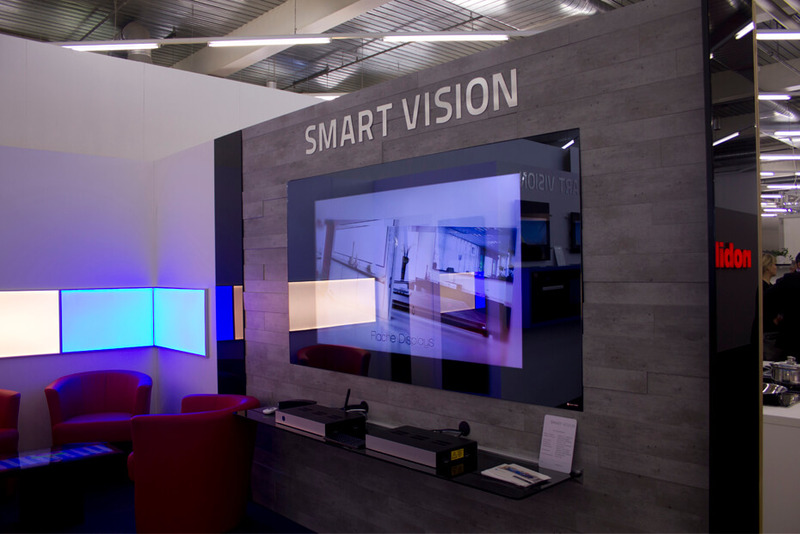 Together with Wagner & Schönherr, we presented a selection of our product innovations at the IMM in Hall 5.2. 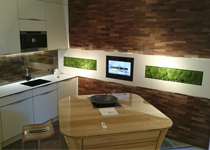 Our products sparked great interest and enthusiasm among the visitors to the IMM and made the fair a complete success. 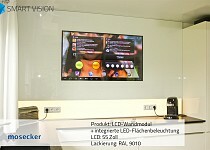 At this fair stand, we presented one of our popular LCD doors with touch control, integrated in a refrigerator front, as well as a 65 inch, in brilliant 4K, LCD wall module in portrait format. 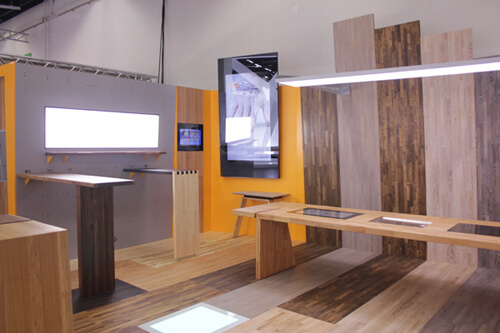 Two more of our products, which we presented at the IMM, were a high-quality LCD sliding door and an elegant 27 inch LCD table integration. 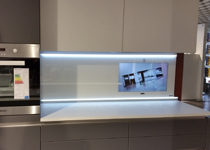 Also present at the fair were two of our extravagant floor models with a 27 inch LCD, behind 10 mm thick savety glass, as well as a dual LED with RGB color change and white LED lighting. 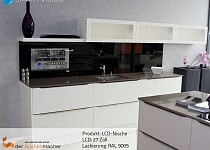 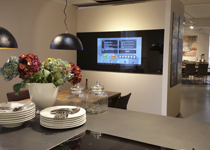 A 27 inches LCD kitchen back wall from the kitchenstudio "Küchenmacher" in Braunschweig with touch control. The niche back wall has a total area of 560 mm x 2730 mm and is tailored to the exhibition. 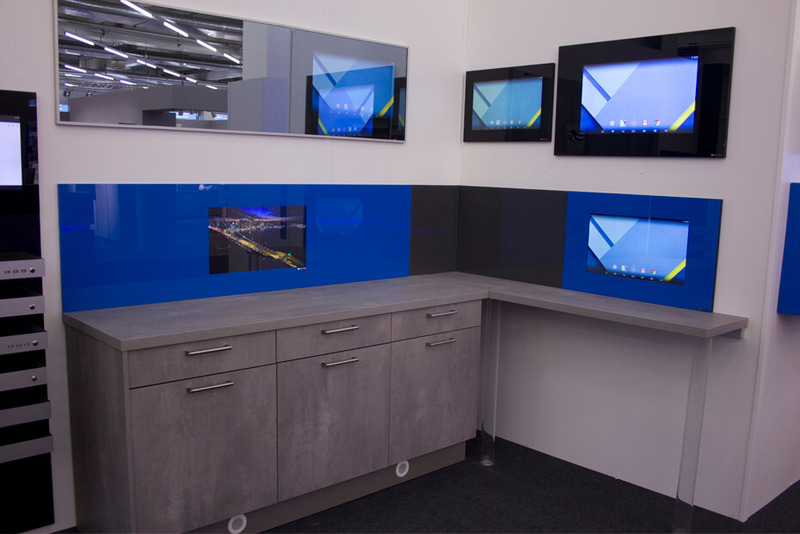 The separate Mediabox was equipped with a satellite receiver and a touch-enabled Android operating system. 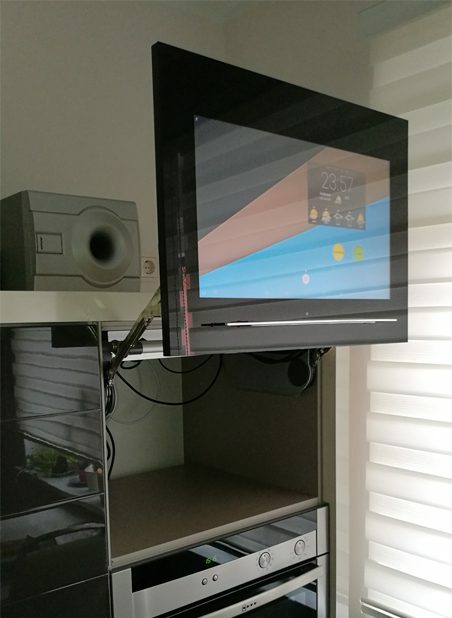 An additional stereo speaker provides the appropriate sound. 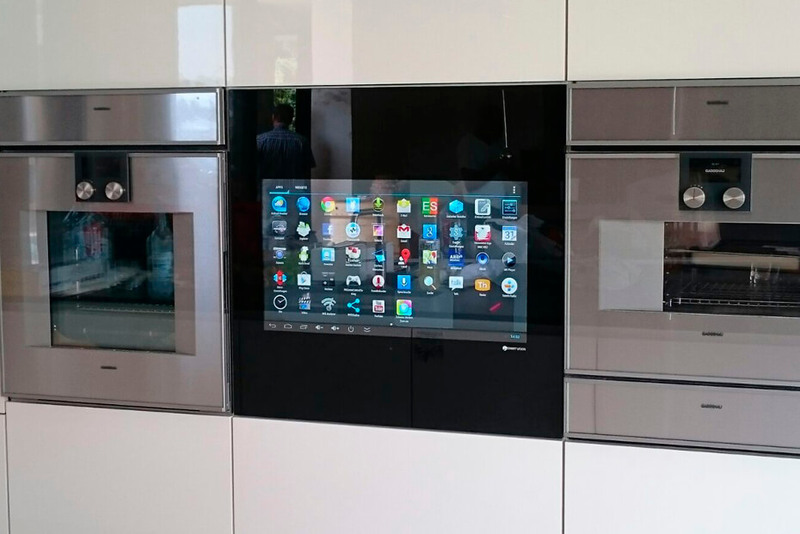 A 27 inch full HD LCD wall module from the Ekelhoff cooking school. 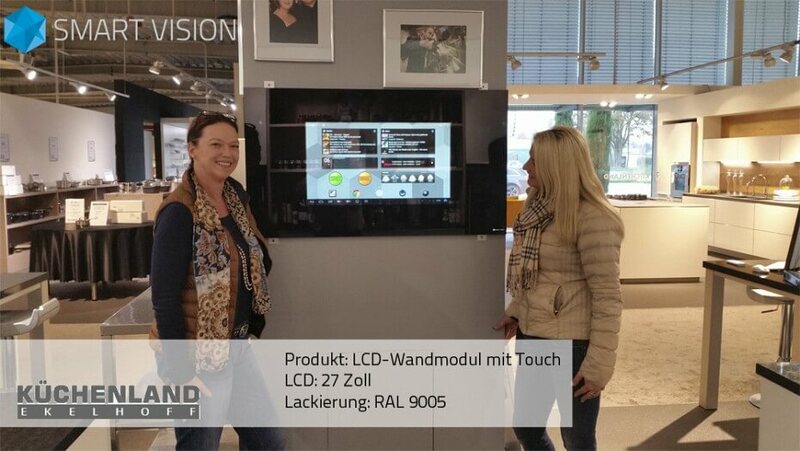 This wall module has been upgraded with our latest technology and can be operated simply by touch. 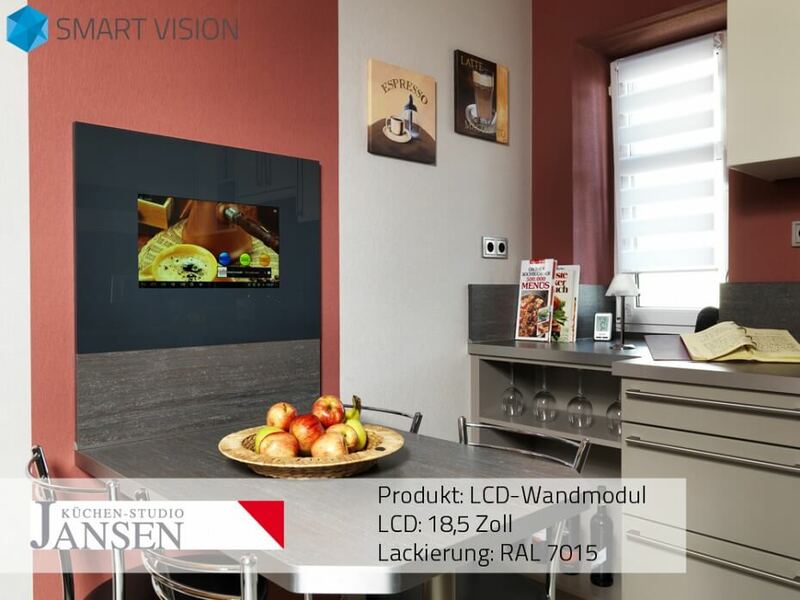 The total area of the wall module is 1073 mm x 600 mm. The LCD display is located behind lacquered glass, in the color RAL 9005 black. 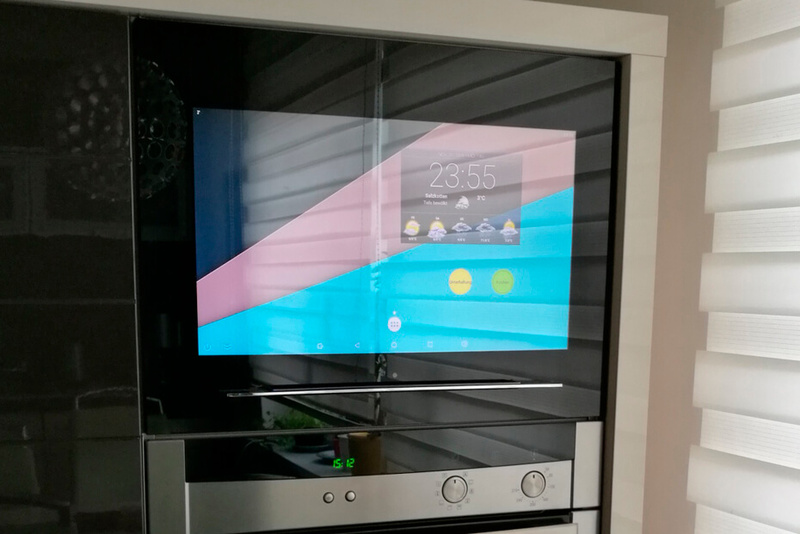 Via our integrated Android operating system, you can view recipe suggestions in the cooking school Ekelhoff during cooking, call up on the screen via the Internet and cook directly on the spot. 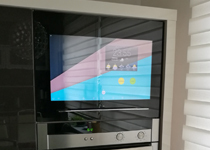 In addition, a TV receiver has been integrated that provides access to brilliant HD TV. 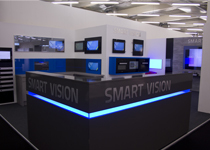 One of our special projects is a 55 inches LED display behind 6 mm thick optiwhite safety glass. 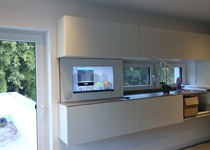 This panel was painted in the customer's color RAL 9010 (pure white). 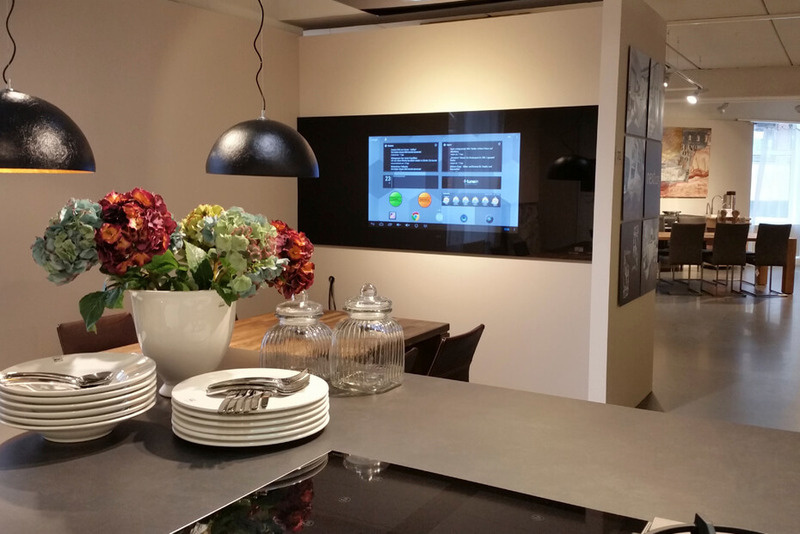 The highlight of this project: the LED lighting under the LCD wall panel, with warm white lighting, behind the glass front. 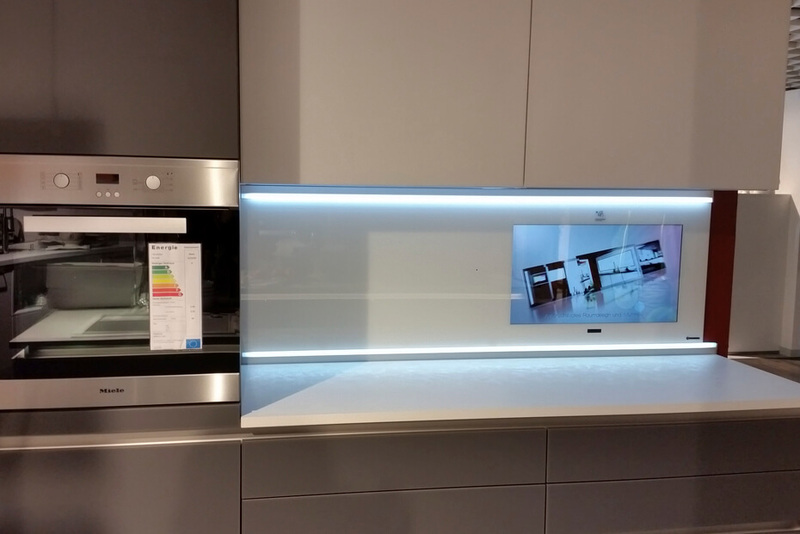 This makes the media panel easy to clean. 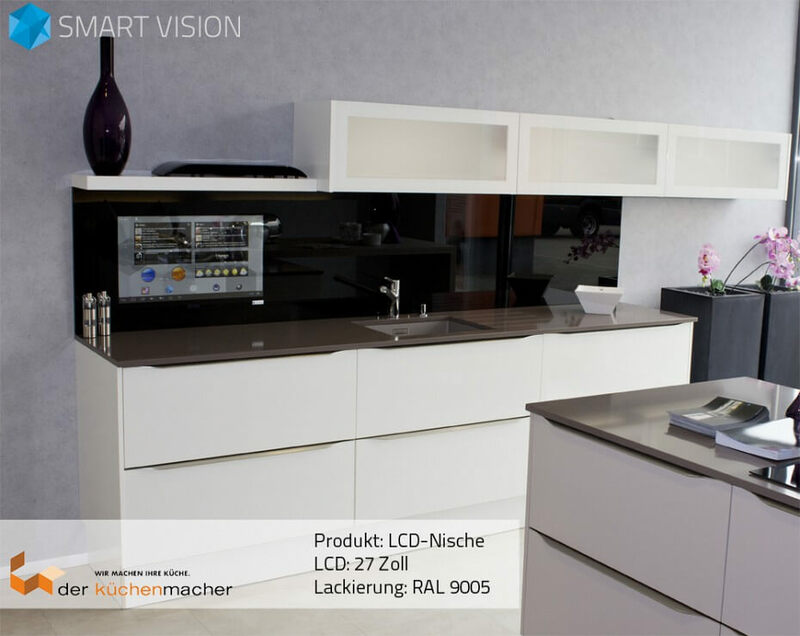 The entire glass surface has a width of 2620 mm, a height of 1520 mm and is tailored precisely to this kitchen situation. 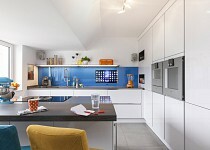 This media panel was added as a finishing touch to this new kitchen. 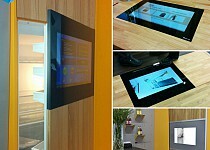 The separate Mediabox has an internet-compatible Android operating system, with apps around kitchen, weather, news, etc. 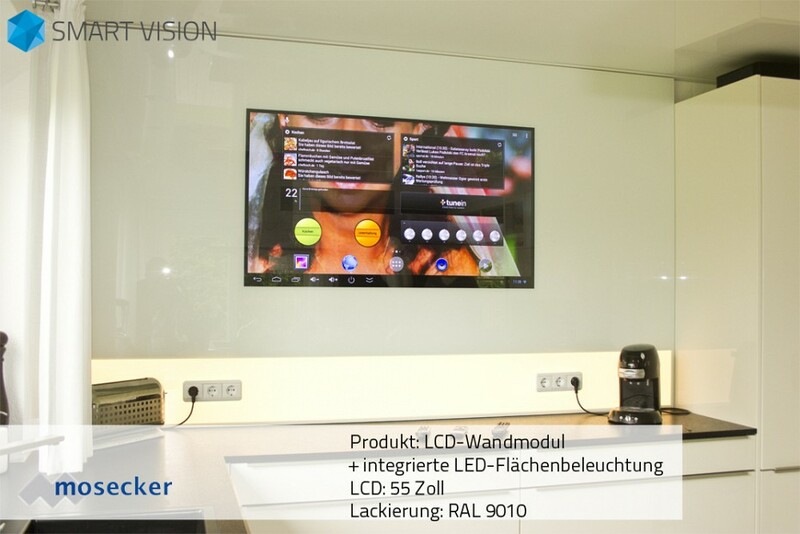 and a SAT receiver for television in HD quality. The six additional sockets round off the functionality of the media panel. 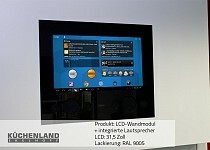 A 21.5 inch LCD door module with touch control. 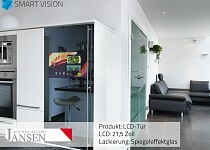 The special feature , the door does not open like a conventional door but upwards. 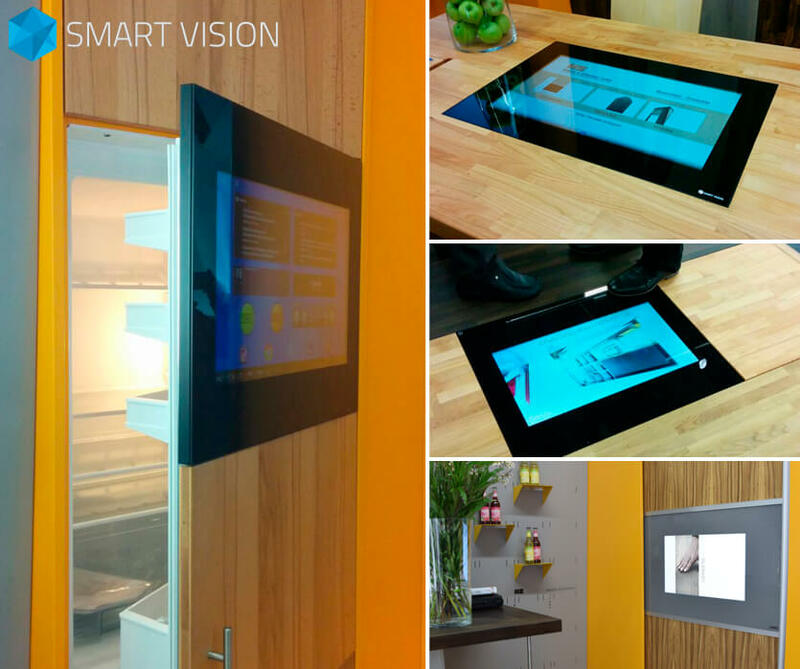 The door module has a total area of 445 mm x 595 mm. 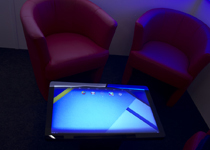 The separate Mediabox was equipped with a satellite receiver and a touch-enabled Android operating system. 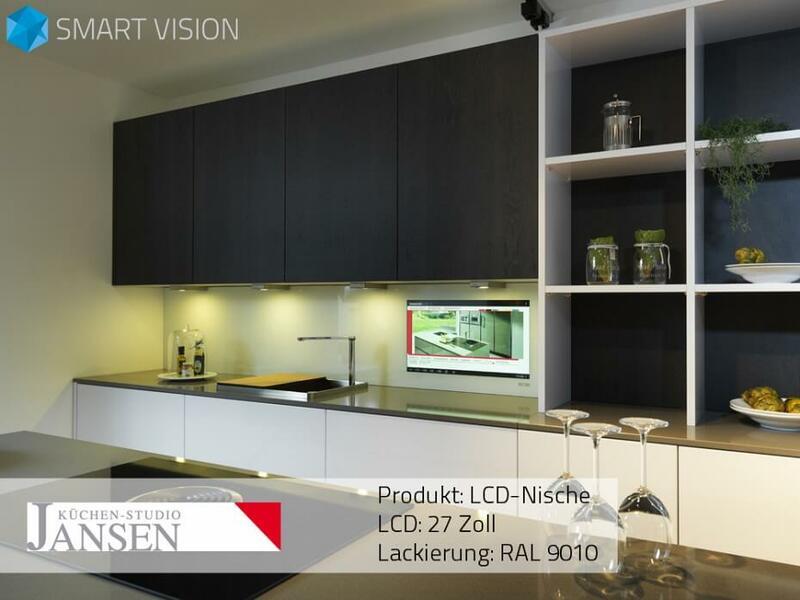 A LCD niche back wall with the dimensions 627 x 1900 mm, which was adjusted precisely to this kitchen situation. 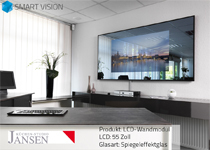 The 37 inches LCD display, with Full HD resolution, is located behind the finest mirror effect glass. 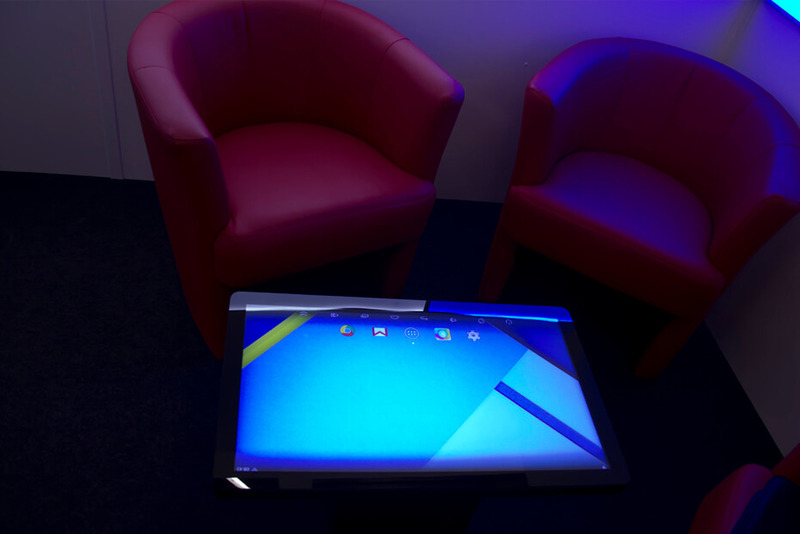 This Mediabox is equipped with an Android operating system, which can be controlled by a remote control. 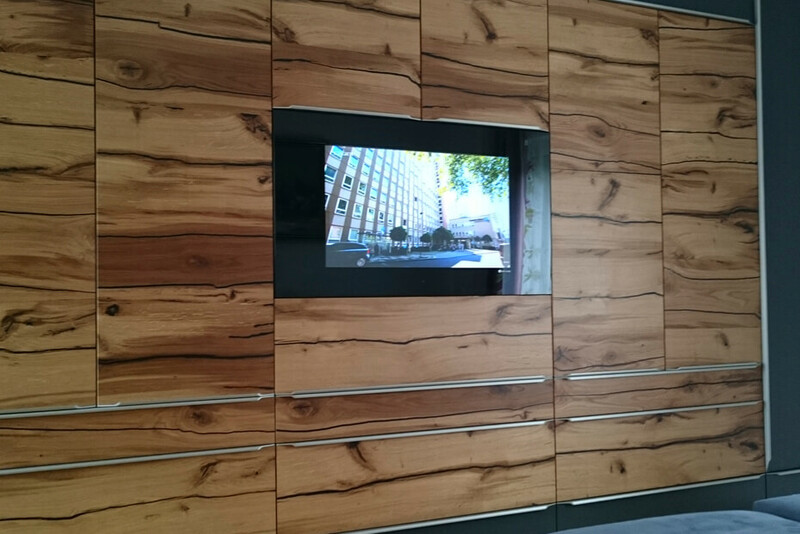 This LCD niche back wall measures 492 x 1600 mm and was painted opal white in RAL 9010 to customer specification. 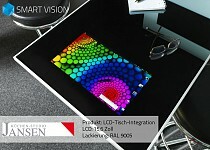 A 27 inches LCD display with full HD resolution was integrated. 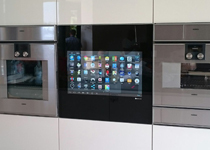 The operation of the Android operating system is via remote controls and touch. 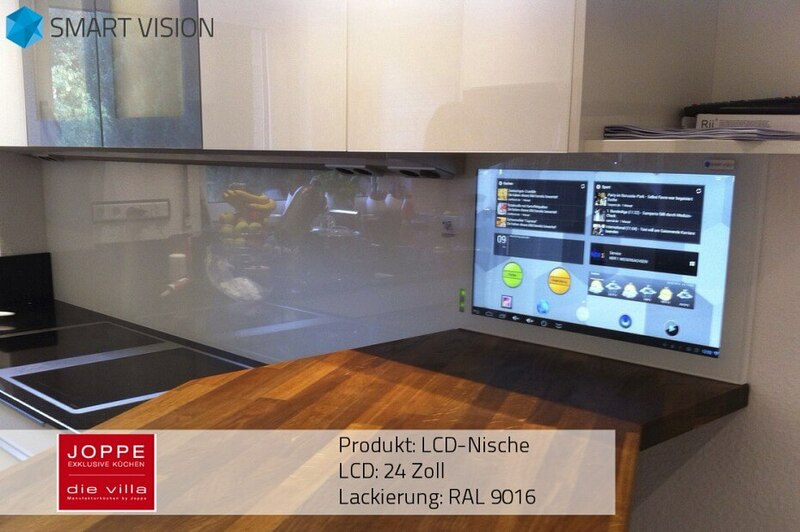 Product innovations from our SMART VISION division at the Munich trade fair Küchenwohntrends. 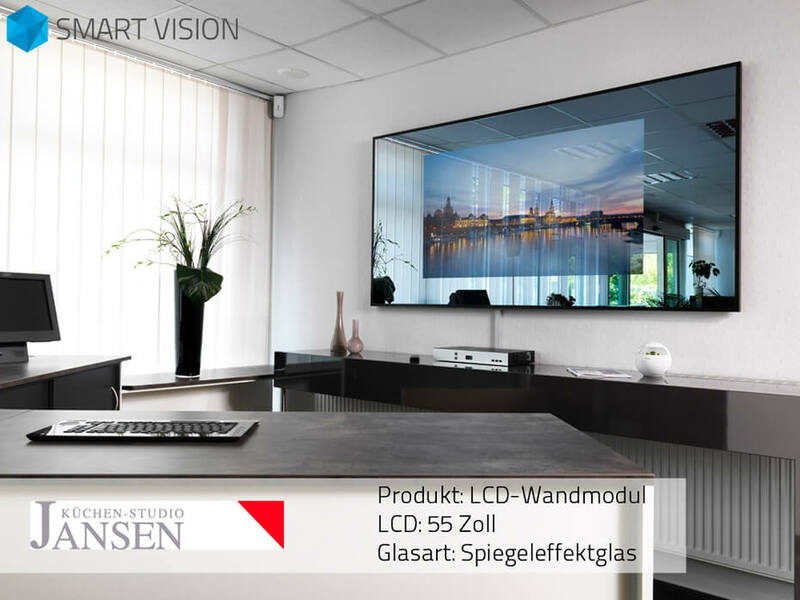 Our classy elegant LCD product series behind glass with multi-touch operation, as well as an innovative 31.5" LCD-coffee table or a 65 inches LCD wall module. 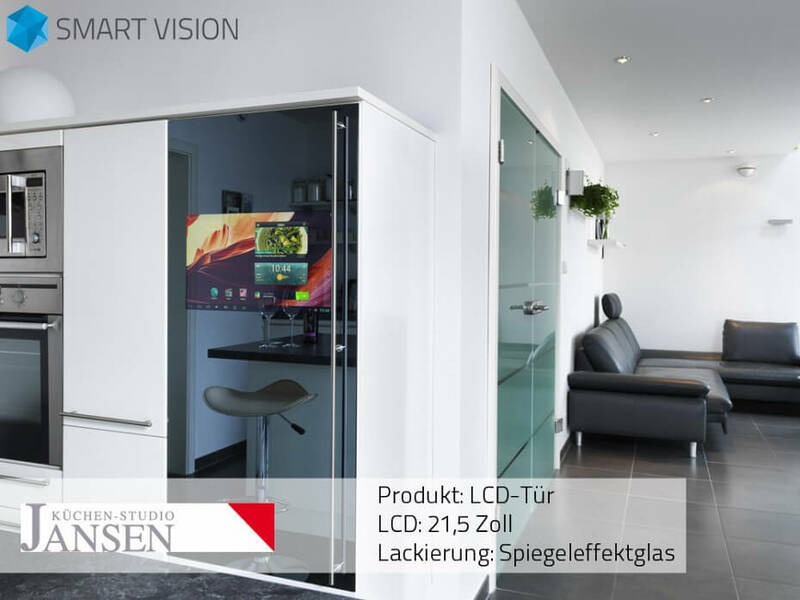 Our popular LCD-Door series, in two versions 595 x 450 mm and 595 x 595 mm, was of course also represented at the Munich fair.